Cody offers a long list of exciting things to do, including world-class museums and year-round recreation. It is worth visiting Cody just for the chance to experience the Buffalo Bill Center of the West. While you're there, you can visit a living history town with frontier buildings, head out to the range to see wild mustangs, raft the Shoshone River, and top it off with a steak and dancing. Cody, just an hour from Yellowstone National Park, will give you an excellent idea of what the wild west, old and new, is all about. 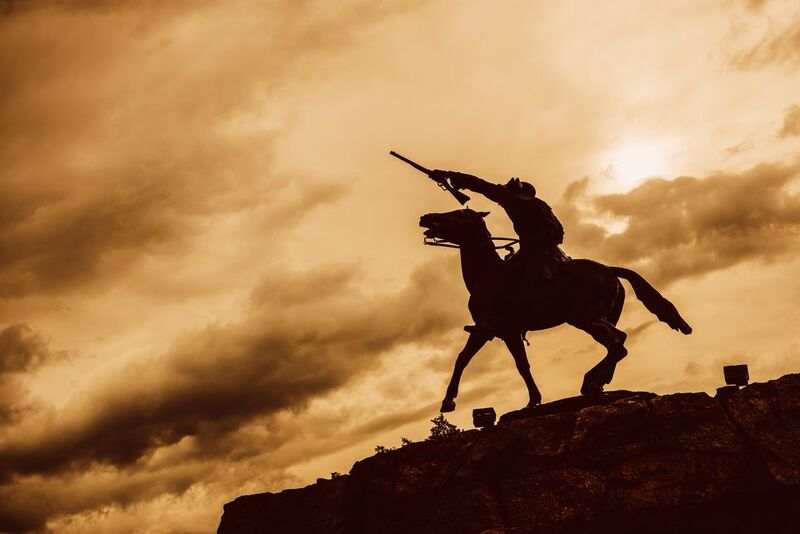 The Buffalo Bill Center of the West, formerly called the Buffalo Bill Historical Center, is a world-class attraction that should be on every American's bucket list. The center is comprised of five different museums: The Cody Firearms Museum, the Whitney Gallery of Western Art, the Plains Indian Museum, the Draper Museum of Natural History, and the Buffalo Bill Museum. Plan to spend the whole day there, or better yet, visit over two days, mixing in time at Cody's other attractions. In addition to the amazing array of fascinating exhibits on the inside, they have a wonderful collection of outdoor sculptures featuring wildlife and Native American figures. Visit the gift shop and bookstore of you’re an enthusiast of western art and history. The center also has an espresso stand and snack bar to fortify you during your long visit. Cody is known as the "Rodeo Capital of the World" and features two annual rodeos. The Cody Nite Rodeo is held every night from June 1 to August 31, and the Cody Stampede takes place July through 4. Visitors have a chance to experience real professional rodeos during the summer in Cody. At the Cody Nite Rodeo, the only strictly night rodeo in the world, you'll see competitive events such as bronc riding, calf roping, barrel racing, and bull riding. In between the events, the master of ceremonies and the rodeo clowns keep you entertained and laughing. Children will have a great time. Bring the family early so the kids can have their picture taken aboard the tame rodeo bull, Mongo, get their face painted by a rodeo clown, and learn to rope. Visit the Nite Rodeo Store for western clothing and souvenirs. Held at the Buffalo Bill Center of the West, Dan Miller's Cowboy Music Revue is just plain fun. You may recognize Dan as he has hosted TV shows such as PBR Bull Riding, American Magazine, and Due West. Dan Miller and his band develop a wonderful rapport with the audience, inviting everyone to sing along to such cowboy classics as "Home on the Range" and "Cool Water." Combine this great western music with cowboy poetry and comedy such as a hilarious Elvis impersonation and you know you'll leave with a big smile on your face. This wild mustang tour takes you via van or bus about 22 miles out of Cody onto Federal lands and the McCullough Peaks Wild Horse Range. They provide the binoculars and you'll get an opportunity to view herds of wild horses as well as spectacular scenery. While you are out on the range for this 2.5 to 3-hour "safari," you may catch a glimpse of pronghorn antelope, golden eagles, coyotes, and black-tailed prairie dogs. They also offer customized photography tours lasting approximately 4 hours. The Shoshone and North Fork Rivers are suitable for both rafting and kayaking. Cody's rafting guide services offer trips ranging from short 1-2 hour floats to half-day adventures. For those seeking greater thrills, whitewater kayaking is an option. Gradient Mountain Sports rents kayaks and gear and offers instruction. River Runners offers family whitewater adventure packages on the Shoshone. Wyoming River Trips can take you rafting through Red Rock Canyon, or through the Colter Falls and Plenty Coups rapids of the Lower Canyon of the river. Cody offers great terrain and facilities for year-round recreation like golf, mountain biking, fly fishing, hiking, and trail riding. In the summer, golf scenic public courses like Olive Glenn which offers an 18 hole Par 72 championship golf course and restaurant. The serious hiker can head to a trail in the Shoshone National Forest or visit nearby Yellowstone National Park, about an hour away. You can bike in town past historic areas or take off outside town for a little mountain biking. The Buffalo Bill Center of the West offers trail rides and even has pony rides for the little ones. Ice climbing, Nordic skiing, and snowmobiling are popular winter activities in and around Cody. Cody Trolley Tours take you around the town, showing you points of interest as they fill you in on Buffalo Bill Cody and the town of Cody. The trolley tour provides a good introduction to the many fun things to do in Cody so think about doing it first. On the tour, you'll not only see key attractions such as the downtown historic district, the rodeo grounds and the Shoshone River Canyon, you'll be entertained by the story-telling guides and step off, after the hour tour, knowing quite a bit of Cody history. If you're interested in the history of the old west of the late 1800's, you'll enjoy a visit to Old Trail Town, a popular family attraction. Old Trail Town is a collection of 26 historic frontier buildings brought from all over Wyoming and Montana to the site by an internationally-known western historian. Many house exhibits of artifacts and photographs. You'll see structures like the original cabins used by wild west outlaws Butch Cassidy and the Sundance Kid and a Wyoming saloon frequented by Cassidy's "Hole-in-the-Wall Gang." There is also a small cemetery at Old Trail Town that includes the grave of Jeremiah Johnson, the subject of a wild west legend involving revenge after the murder of his wife and eating the livers of the suspected perpetrators. Thus, he was called "Liver-Eating Johnson." During your visit to the Buffalo Bill Dam, on the western side of Cody, you can walk across the dam and enjoy spectacular views in all directions. Facing east, you'll look down 325 feet to the Shoshone River, and facing west, you'll have a closeup look of the Buffalo Bill Reservoir. The Buffalo Bill Dam was completed in 1910 and, at 325 feet high, it was the highest dam in the world at that time. It was one of the first concrete arch dams built in the United States. The dam has a visitors center where you can learn about the construction of the dam, look at exhibits about farming and area wildlife, and visit the gift shop. In addition to a hearty meal, you can enjoy live music and dancing at Cassie's Supper Club and Dance Hall. Cassie's current building is an expansion of her original business, first opened in 1922. The 20,000 square foot building has three levels with dining areas, a room for private parties, three bars, and a large dance floor. Parts of the original building and western themed decor remain. Cassie's is known for its steak. Steaks are hand cut to order just before grilling and the prime rib can be cut to order as well. Seafood, chicken, and pasta round out the menu. Children are permitted in the dining areas and banquet room until 10 p.m. While Cody has its fair share of touristy gift shops, there are quality stores and galleries in town, too. Anyone into outdoor recreation will appreciate the chance to stop by the Sierra Trading Post Outlet Store. Western art lovers will enjoy Cody's art galleries, including the Big Horn Gallery and Simpson Gallagher Gallery. The Cody Art League hosts an annual art show featuring local artists. For some authentic western gear, mosey on over to Seidel's Saddlery. An ideal souvenir of your visit to this wild west town would be a hand tooled western belt or piece of turquoise jewelry. The saddle shop, upstairs, is where Keith Seidel has been a full-time saddle maker and leather craftsman for over 30 years. Those with a sweet tooth should over to the Cowtown Candy Company and sample their fudge, handmade truffles, and Wyoming logo chocolate bars.